Catholic World Mission strongly emphasizes evangelistic revival and spiritual development in its core values. 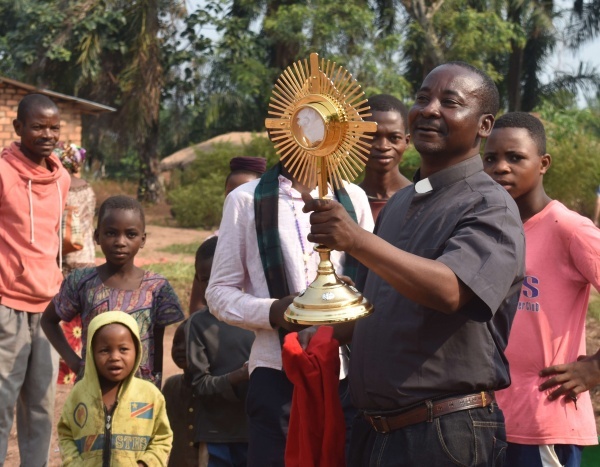 Our latest endeavor involves providing underprivileged parishes and communities with monstrances to foster increased devotion to the life-giving power of the Eucharist. Why would I go to Adoration? 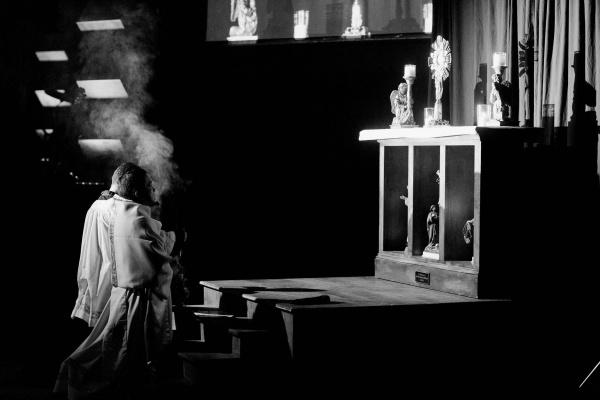 Does Adoration benefit the greater church community? Eucharistic Adoration is a Catholic tradition in which we get to be in the presence of the exposed Blessed Sacrament. 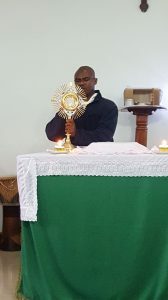 The Body of Christ is held in a monstrance and stationed in a designated space, usually the altar or chapel, which allows us to have personal, tranquil, and uninterrupted time with Jesus. 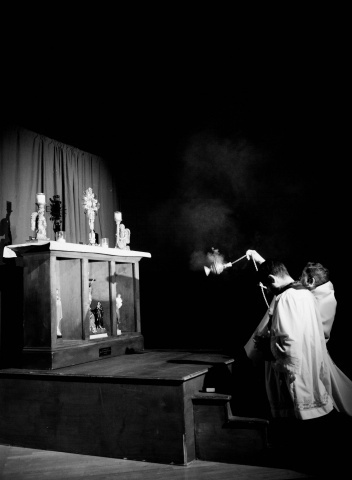 A consecrated host, one that has been transformed at Mass to the actual Body of Christ, is removed from the tabernacle. 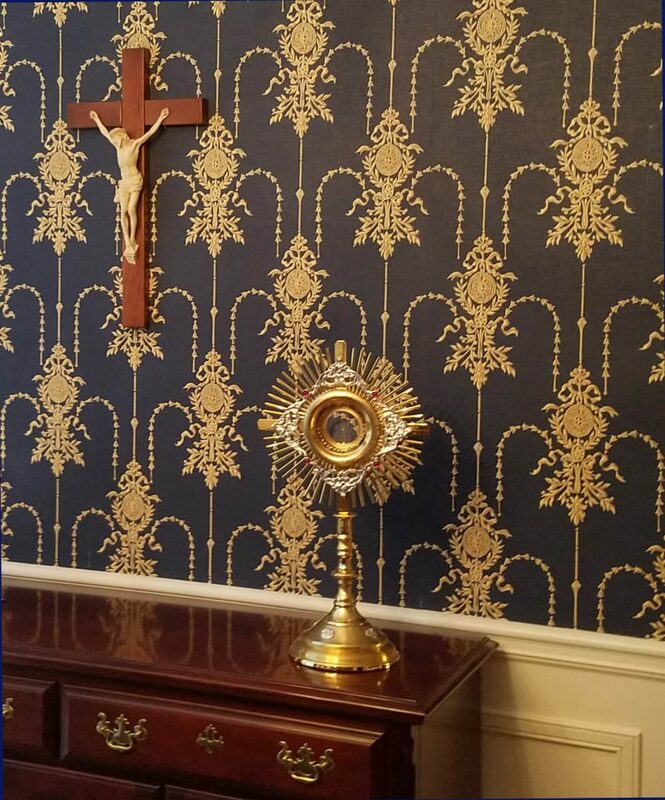 While the tabernacle does hold the consecrated hosts, is available for prayer, and given reverence, the Eucharist is still covered, concealed, and usually locked inside. 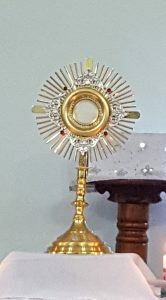 For Eucharistic Adoration, the host is placed in a monstrance that contains a glass compartment (called a luna) and exposes the Eucharist before all. 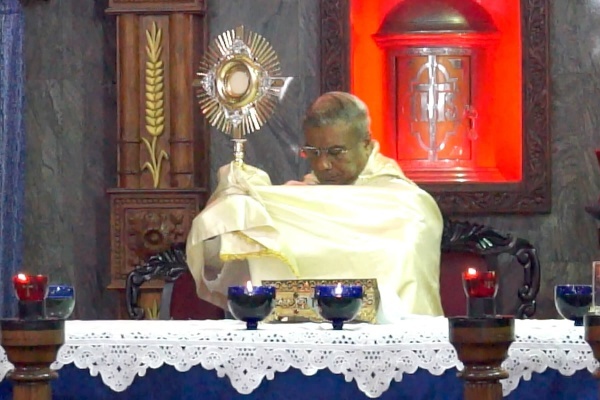 The exposition of the Blessed Sacrament proves to be the key and most important factor of Eucharistic Adoration. 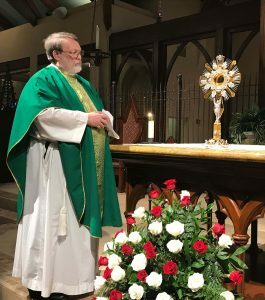 If the parish chooses to only have particular hours for Eucharistic Adoration, an ordained minister will repose the Blessed Sacrament and place it back in the tabernacle. The exposition of the Blessed Sacrament serves as an extension of the adoration and praise of the Body and Blood of Christ during the Mass. Eucharistic Adoration allows us to acknowledge the strength and almighty power of our Lord and Savior. During this time of reverence, visitors may pray, recite the rosary, read scripture, offer intentions, or simply sit in the presence of the Lord. Open to anyone, Eucharistic Adoration also assigns the visiting adorers the responsibility of being a guardian to the Blessed Sacrament. This silent period of time with Jesus gives many people the blessing of internal peace, greater hunger for Communion with God, and deepened assurance in His power and presence. The origins of Eucharistic Adoration can be dated back to the time of Jesus’s first apostles. 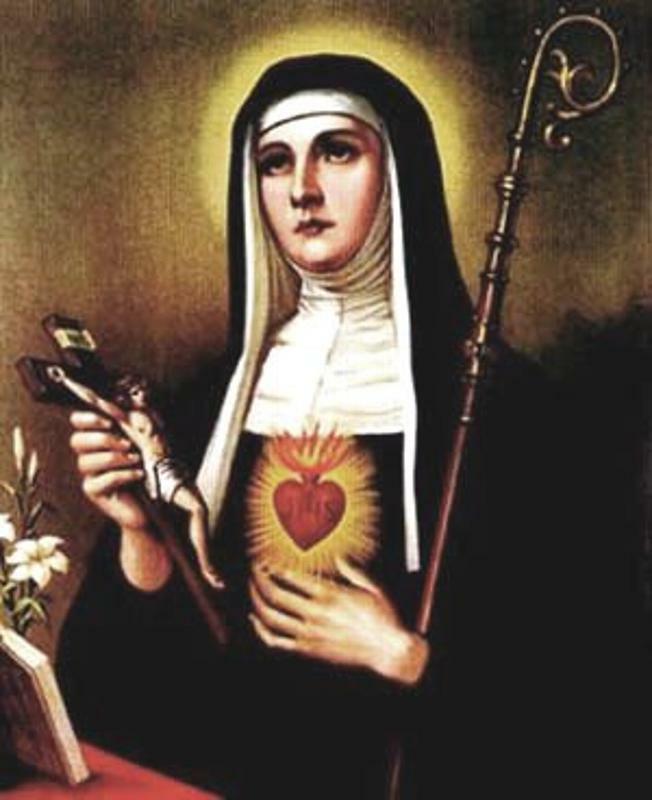 These evangelists strongly emphasized the physical presence of Christ in the Eucharist and its role in being a continuation of Jesus’s saving mission. Influenced by this faith, early hermits would conceal and often preserve the Eucharist in their caves for safekeeping. They would also carry the Eucharist on their person when traveling. By the Fourth Century, the Eucharist was commonly reserved in monasteries and convents and served the primary purpose of reaching the sick and dying. The keeping of the Blessed Sacrament in religious houses became very guarded, often under lock and key. The 11th century brought extremely controversial voices that rejected and criticized the physical transformation of bread and wine into the Body and Blood of Christ. Pope Gregory VII, defending against this heresy, clarified the Church’s teaching on the Eucharist: Jesus is truly and actually present in the Eucharist. 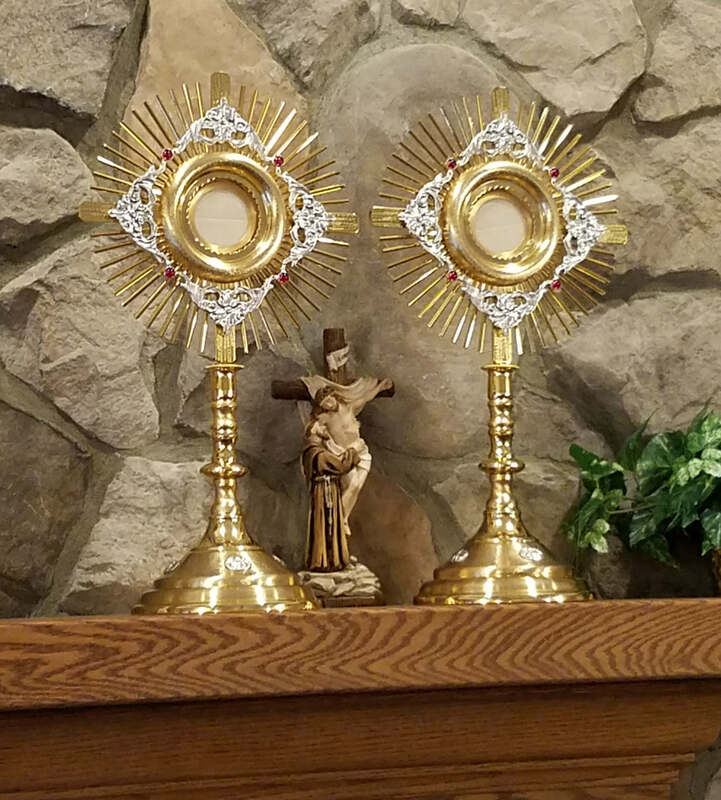 This clarification created various gateways for visits, viewings, and adoration of the Blessed Sacrament. This “eucharistic renaissance” brought about a more open and available worship of the Blessed Sacrament. 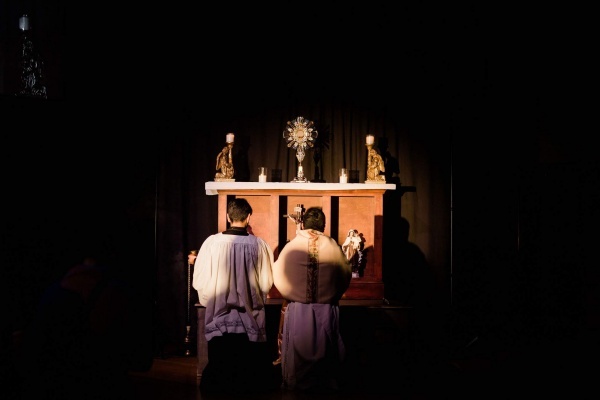 Since then, the ability to adore and be before the Eucharist has developed greatly and continues to move the hearts of countless individuals and communities. 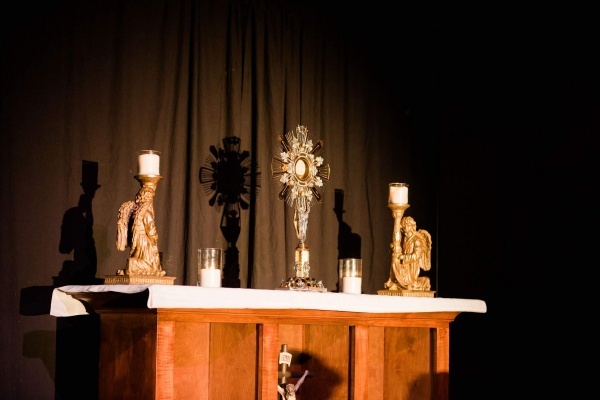 By attending Eucharistic Adoration, we are accepting an invitation from Jesus to grow closer to Him. With the presence of the exposed and physical being of Christ, God reveals his tenderness to us in the silence. By allowing God into our hearts, He gives strength and hope to those who wander or are lost. Eucharistic Adoration blesses one with a temporary escape from the secular world to bring our struggles before God. Away from noise and distractions, adoration opens an opportunity for healing, guidance, enlightenment, forgiveness, and peace. Anyone is welcome to visit and pray with the Blessed Sacrament. God makes his grace available to all his children. From individuals to groups to entire parishes, Eucharistic Adoration is offered to all for petitions and thanksgiving. 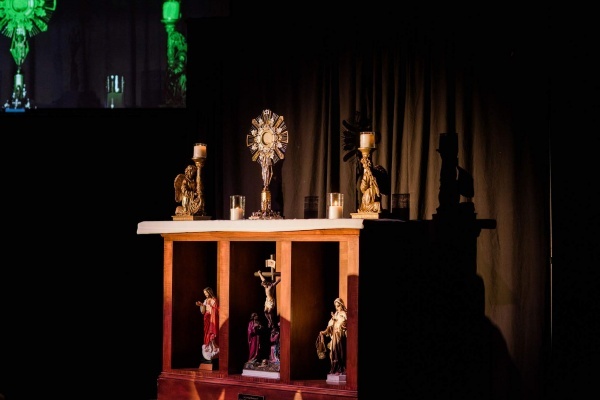 The tradition of Eucharistic Adoration also brings an abundance of blessings for the parish. 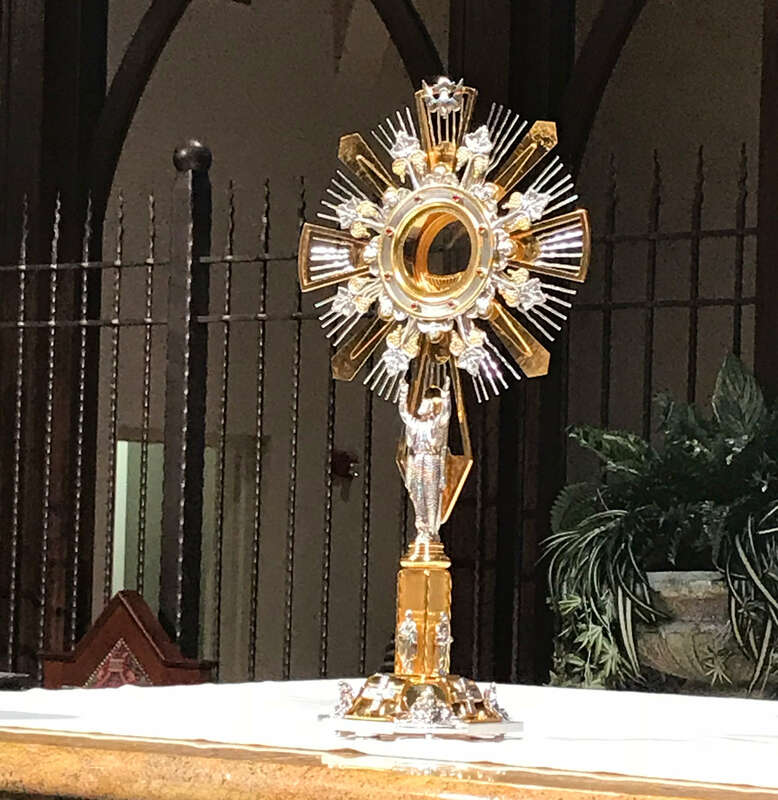 Whether attending on a whim, on your own schedule or signing up for a specific guardian time, attending adoration increases your involvement in parish life. 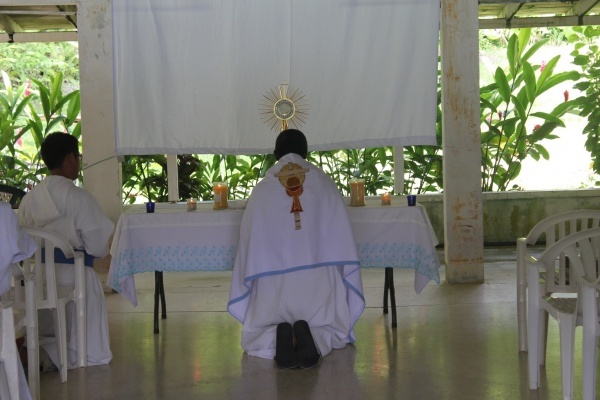 Exposition of the Blessed Sacrament offers a place for the community to come together in deep prayer and adoration. God pours out his love and support to parishes in need. Parishes that become anchored in Christ in this way are able to withstand any challenge, change, or shortcoming. The Eucharist is also a sign of personal communion with God. The more we develop this spiritual relationship on a personal, individual level, the better we get at developing an authentic love of neighbor, which strengthens the parish family. On August 18, 1996, Father Alejandro Pezet was saying an evening Mass at a Catholic church in central Buenos Aires. 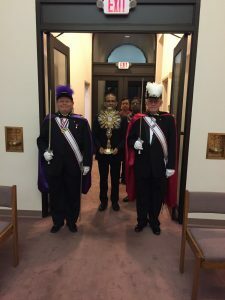 Upon finishing distributing communion, a woman came forward and informed him that a discarded host had been seen on a candleholder in the back. 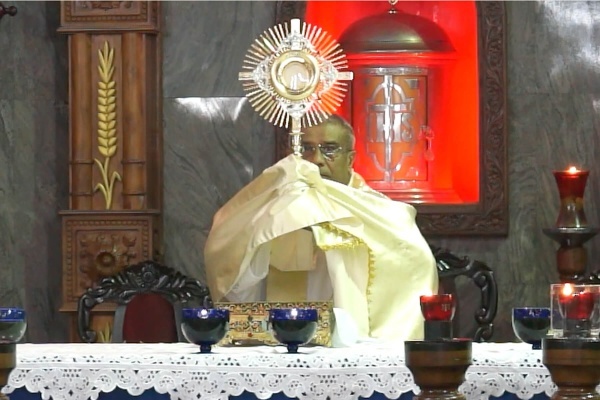 Unable to consume the host, Father Peret placed the Blessed Sacrament in a vessel of water in the tabernacle to allow it to dissolve. The following Monday, Father Peret was astonished to find that the host had transformed into a significantly larger and bloody substance. Kept in secret and rejecting decomposition, the host was under lock for a few years. Cardinal Bergoglio, now Pope Francis, had the substance scientifically analyzed by various specialists who determined that the mysterious substance came from an actual piece of human flesh. More specifically, it was announced to be a part of the left cardiac ventricle, a muscle responsible for pumping blood to the rest of the body. Furthermore, scientists concluded that due to an inflamed condition and an excess amount of white blood cells, the heart must have been alive when the sample was taken and had undergone severe amounts of stress. 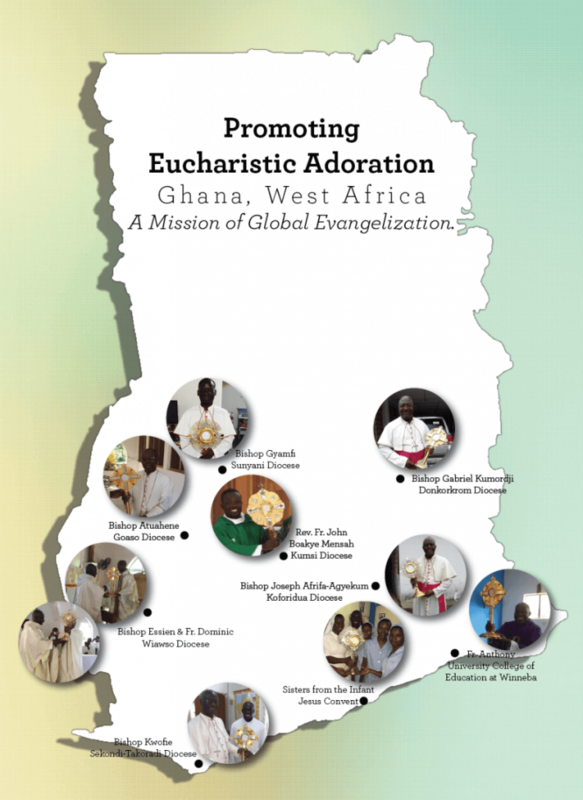 Explore the tabbed sections below to see where you’ve helped spread the gift of Eucharistic Adoration! DR Congo has been locked in a violent civil war for years. 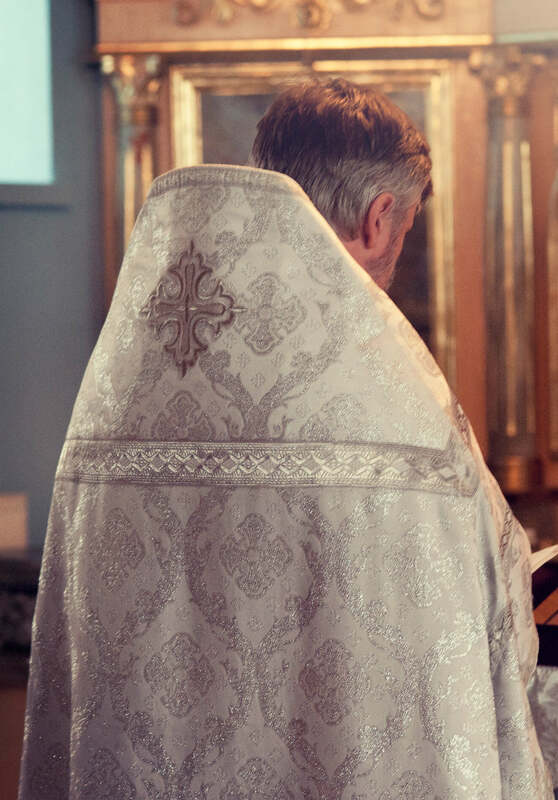 In the summer of 2017, the Church was targeted by the warring factions, forcing priests, religious sisters, seminarians, and bishops to go into hiding. Churches have been burned, including monstrances still containing the Blessed Sacrament! The Church has been heavily targeted. 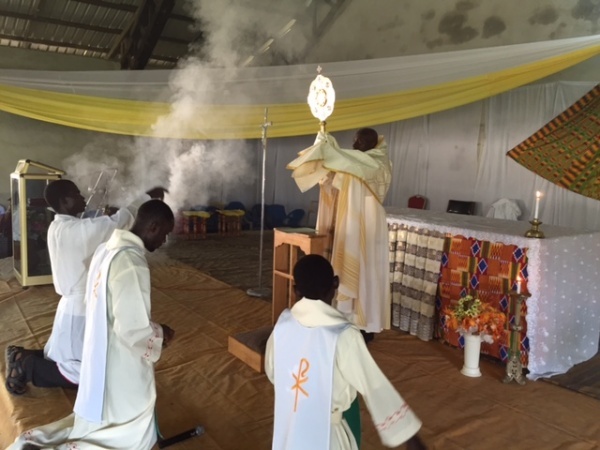 The Cathedral of St. John the Baptist in the Diocese of Luebo was desecrated on March 31. 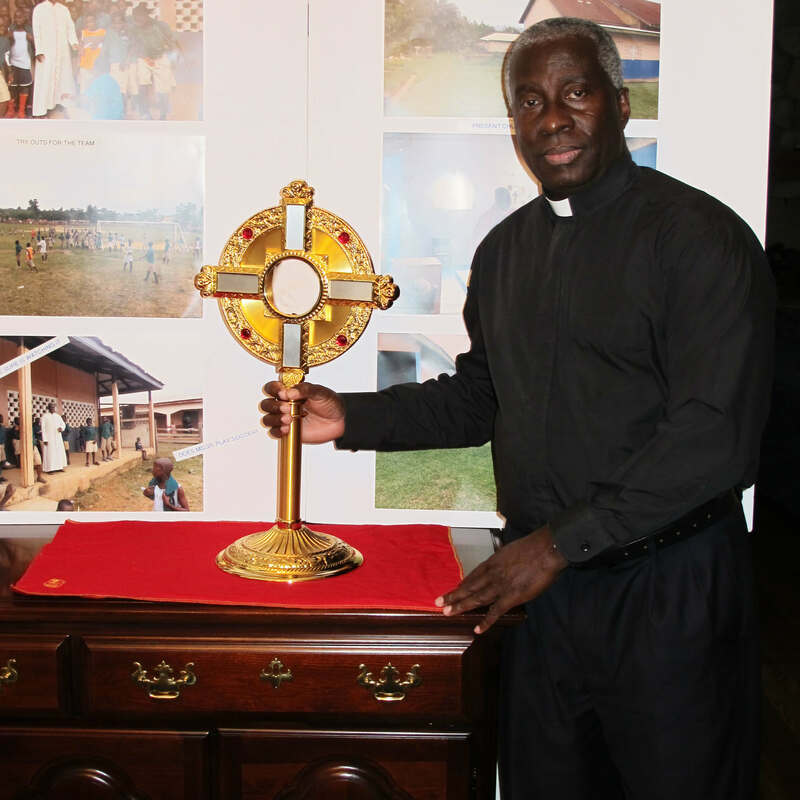 This is the seat of our friend and supporter of Ndekesha Orphanage, Bishop Pierre Celestin. He has fled the diocese for his safety. The priests of the Diocese of Luebo have also fled. Some are still in DR Congo, living in groups in the bush or hostels, but many others have fled to other countries, including a refugee camp in Angola. 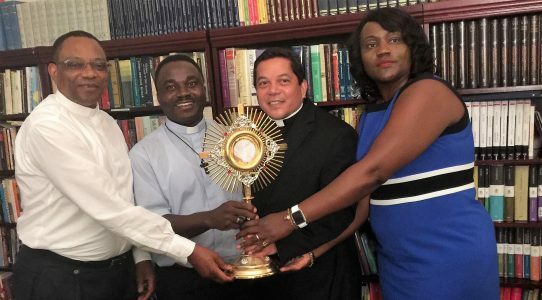 Catholic World Mission committed to getting a new monstrance to the Diocese of Luebo when the news of the violence broke. 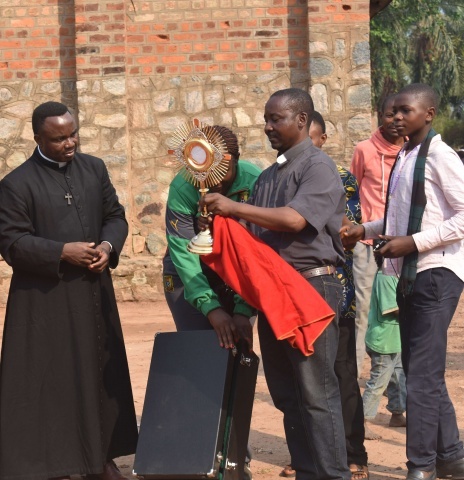 We wanted to restore the gift of adoration to the Diocese of Luebo by replacing the monstrances that were desecrated by fighters. We know the importance of being able to sit face-to-face with Jesus, especially in the midst of suffering. 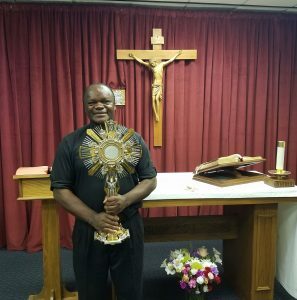 One of the main tenets of our faith is that the Lord is always near to us, especially in the Blessed Sacrament, and we wanted to help Bishop Celestin bring adoration back to his diocese. Pictured below: Atlanta, USA – Fr. Constantin Panu and Fr. Donatien Beya, both of the Diocese of Luebo in DR Congo, receive a new monstrance. 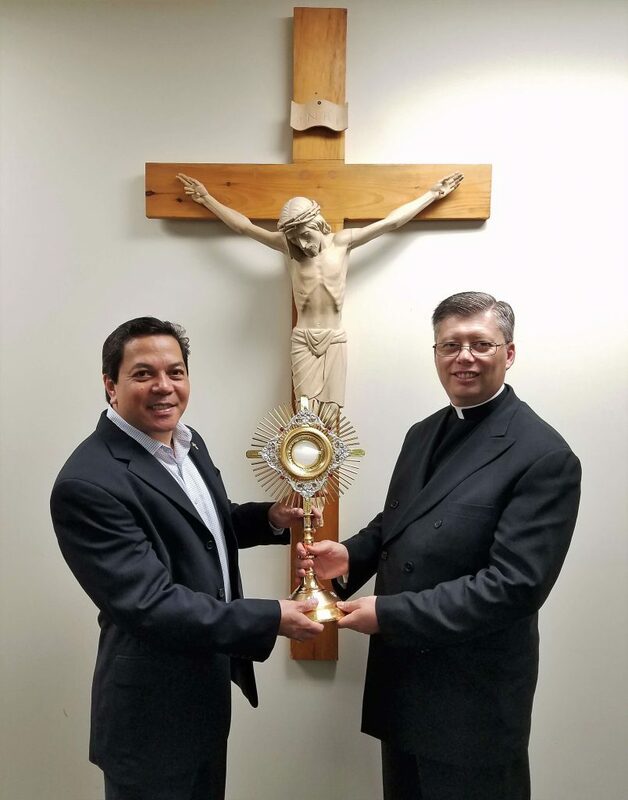 CWM Executive Director Deacon Rick Medina and CWM partner Ide Maka present the monstrance. 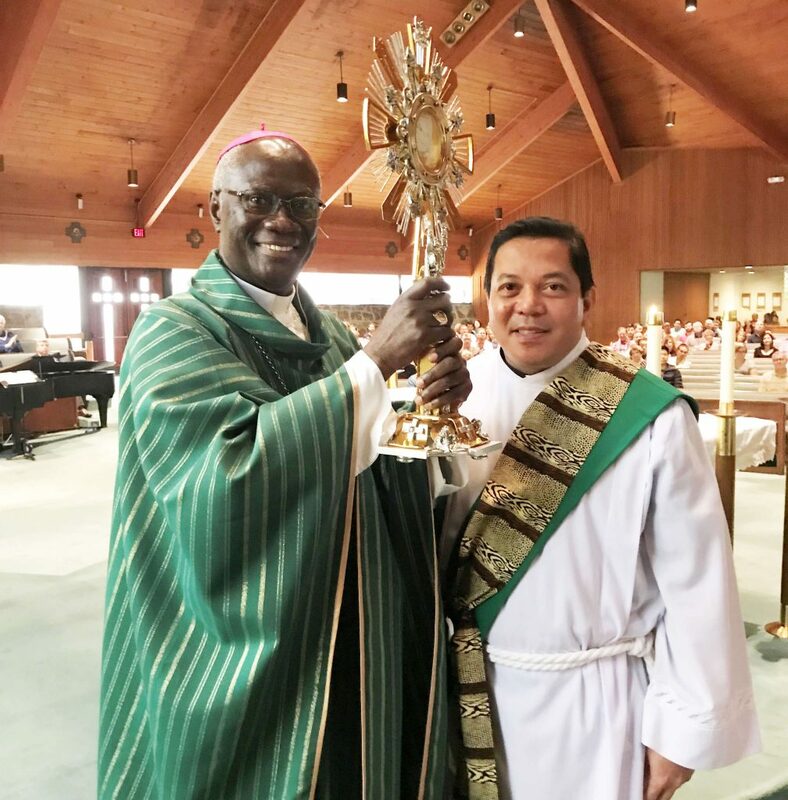 Thanks to your help and generosity, we were able to give a monstrance to Bishop Celestin. 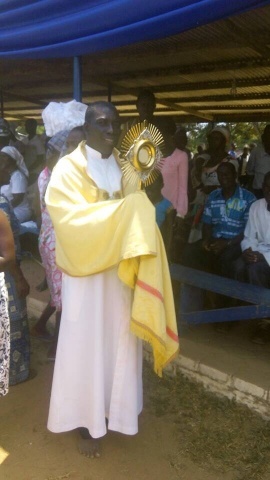 You made it possible for the faithful in DR Congo to be physically near to Jesus in the Eucharist, even in the midst of violence and fighting. 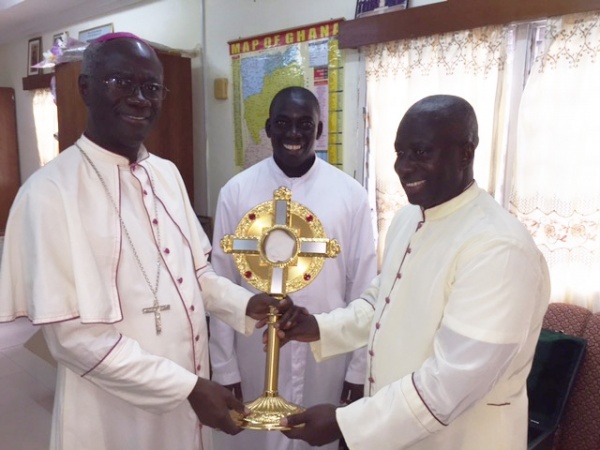 Ghana was the first country to be sent a CWM monstrance in 2010. 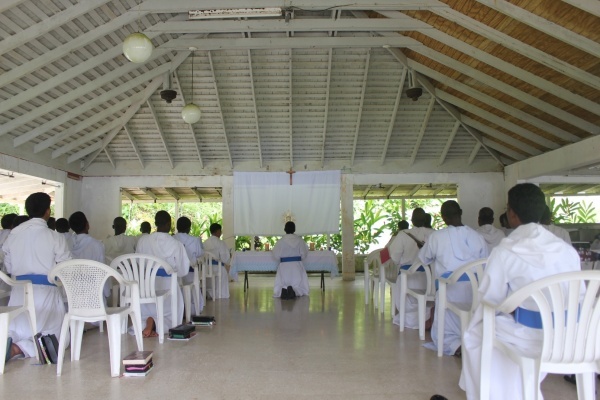 The Church there is organized so that a parish priest oversees his own parish and any number of outstations. These outstations can sometimes be many miles apart. 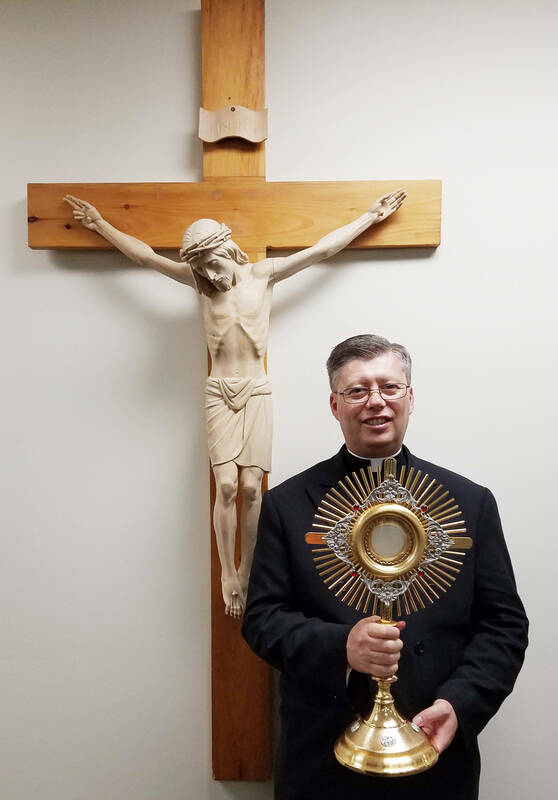 Our hope is to send a monstrance to each diocese to aid the priests not only in their personal prayer lives but also as they work to evangelize their flocks. 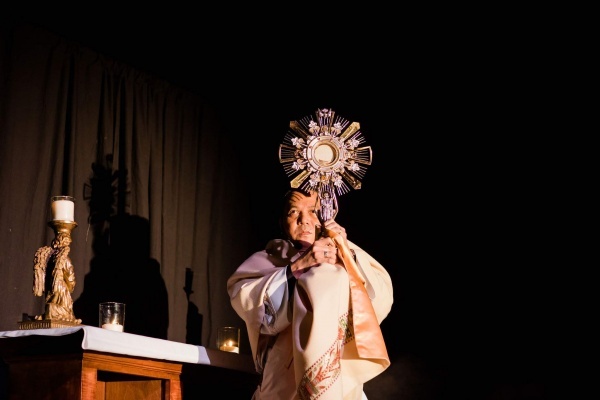 We want as many people as possible to be able to encounter Jesus in a transformative way through Eucharistic Adoration! 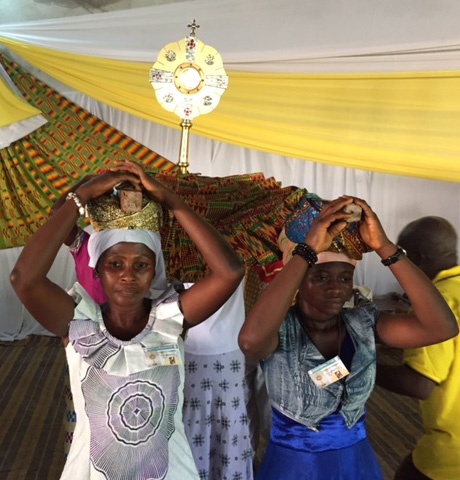 As of the fall of 2017, 12 monstrances have been distributed in Ghana. 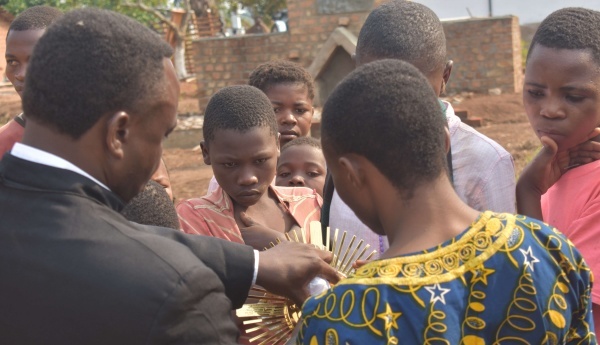 With God’s grace, communities around the world will be lifted up through the power of the Eucharist one monstrance at a time. 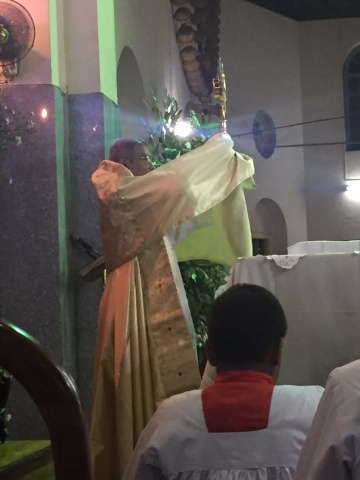 2018 – Two More Monstrances Given to Ghana! 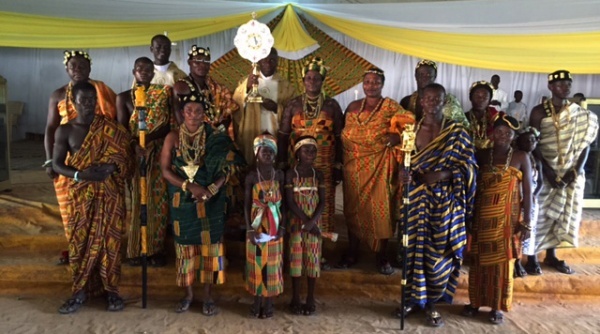 2018 saw two more monstrances given to Ghana. 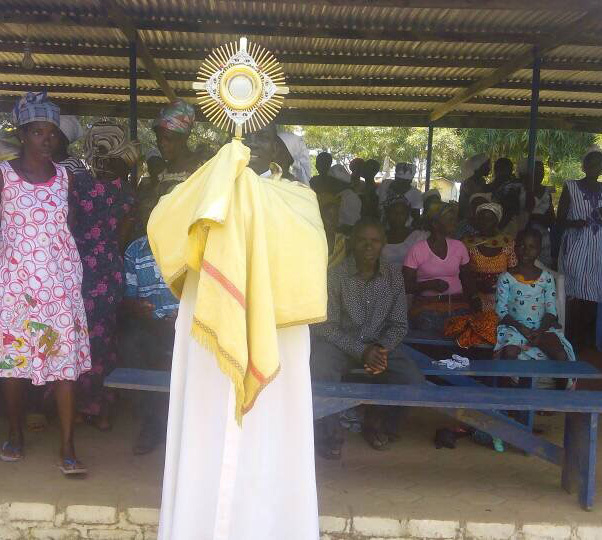 We are so excited to be able to continue spreading Eucharistic Adoration throughout Ghana. 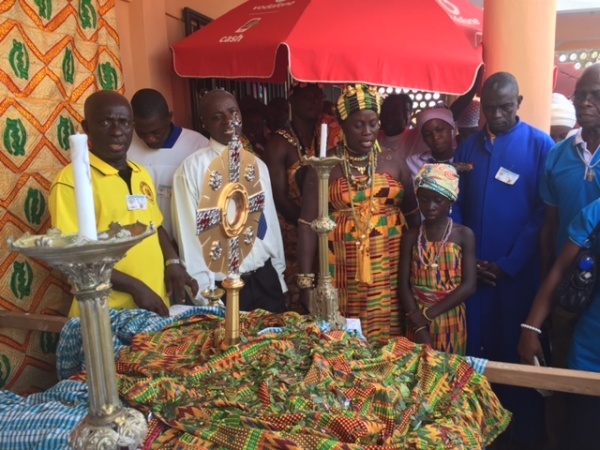 In June, Deacon Rick Medina traveled to Ghana for the dedication of the newly build Immaculate Conception Parish in Enchi, Ghana. 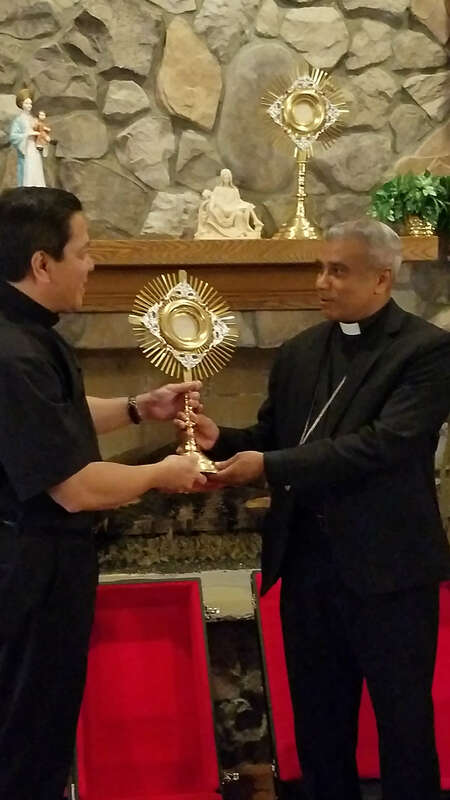 While he was there, he presented a monstrance to Msgr. 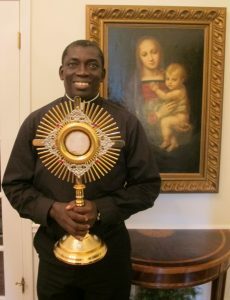 Simon Assamoah and Fr. 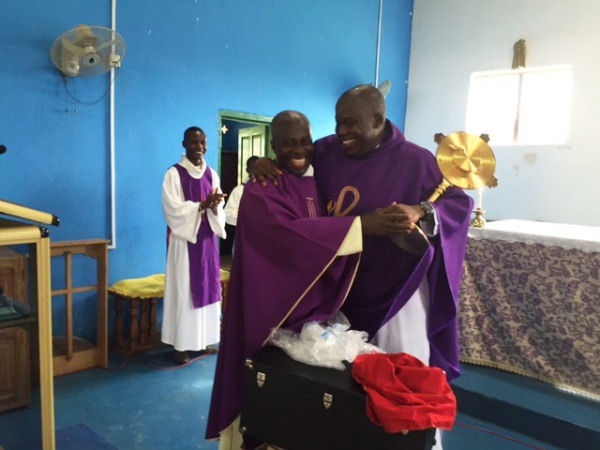 Anthony Eshun, two of our partner priests in Ghana. Bishop John Kwofie, Diocese of Sekondi-Takoradi, visited Atlanta in October 2018. 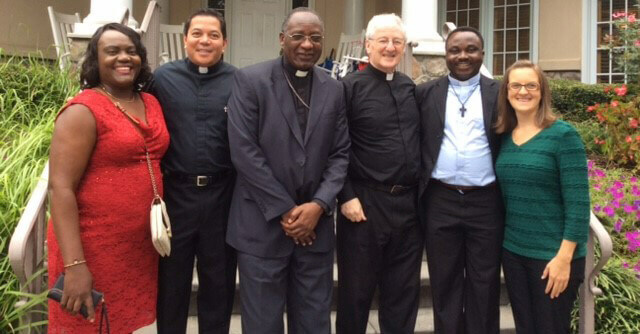 Bishop Kwofie was in town to raise awareness and funds for his diocese in Ghana. 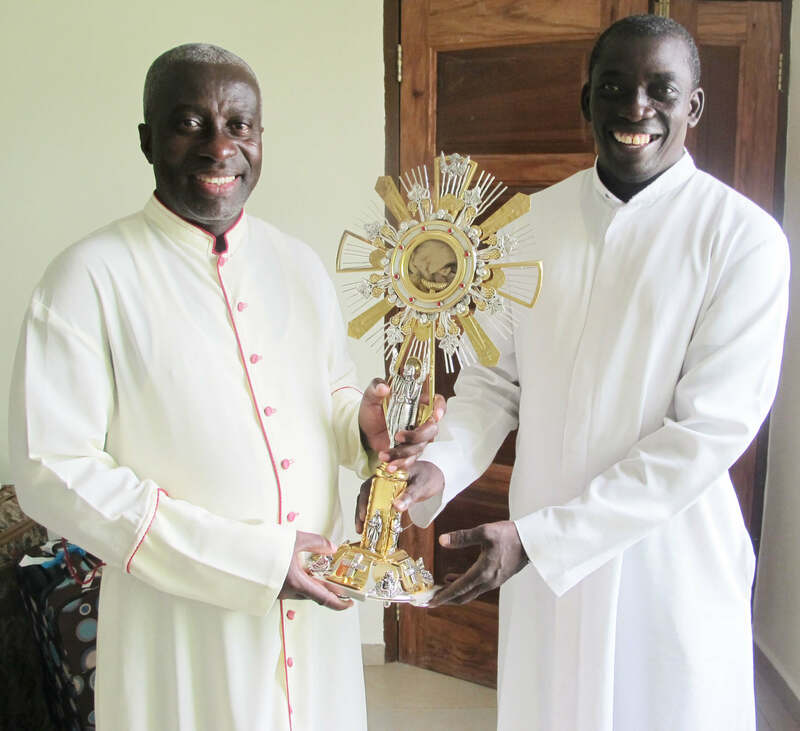 It was a happy surprise for him to be able to receive a new monstrance as well! 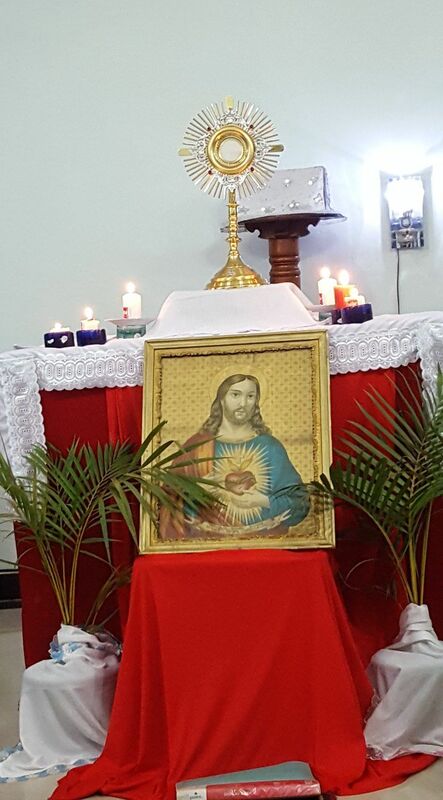 It is our sincere hope that many, many souls come to know the ever-present, never-failing love of Jesus through spending time in prayer before the Blessed Sacrament. Thank you for all you do to make it possible for people to encounter Jesus Christ this way. 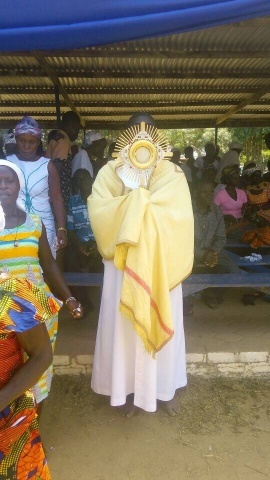 Visit the Updates tab to see photos of monstrance distribution in Ghana over the years! In 2018, we were able to send a monstrance to the Missionaries of the Poor in Nairobi! 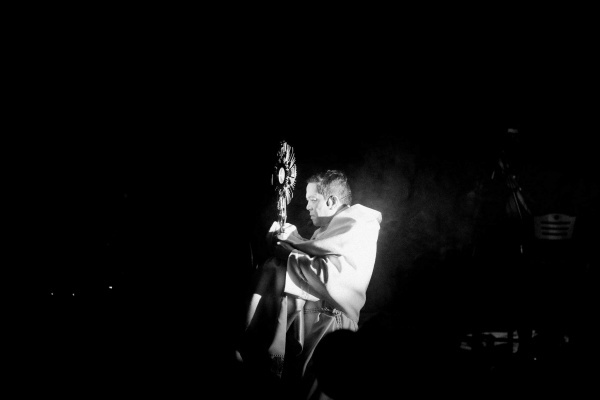 Our longtime partner, Fr. Eugen, was able to visit Atlanta in May 2018. 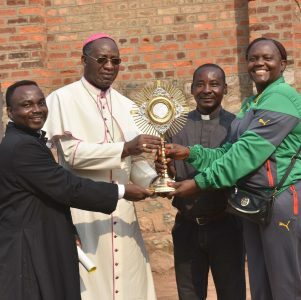 We gave him a monstrance, which he received on behalf of Bishop George Nkuo, Diocese of Kumbo. 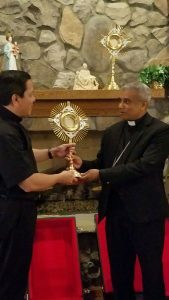 A chance encounter while Bishop George Varkey was visiting Atlanta led to us giving him a monstrance. Madagascar, an island off the coast of Eastern Africa, is one of the poorest countries in the world. 70.7% of the population lives below the poverty line. 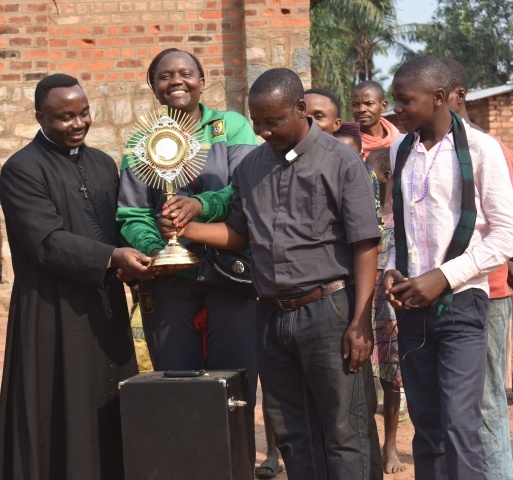 Our partner, Ide Maka, was able to visit DR Congo this summer and deliver the monstrance received by Bishop Celestin last year. 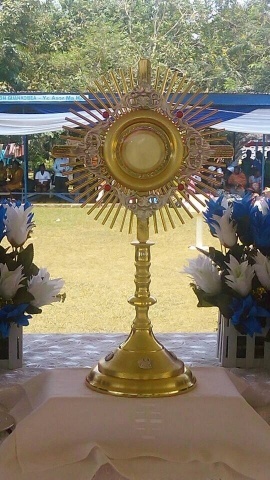 The monstrance was given to Fr. Vincent Tshindayi, pastor of Our Lady of the Seven Sorrows of Ndekesha. The parish supports faithful in Ndekesha and Kazumba. 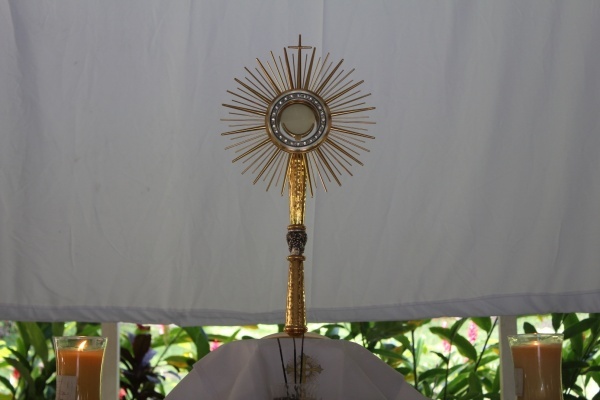 This monstrance will give many people the opportunity to draw near to Jesus in the Blessed Sacrament. Check out the photos in the carousel below to see more photos of the presentation. 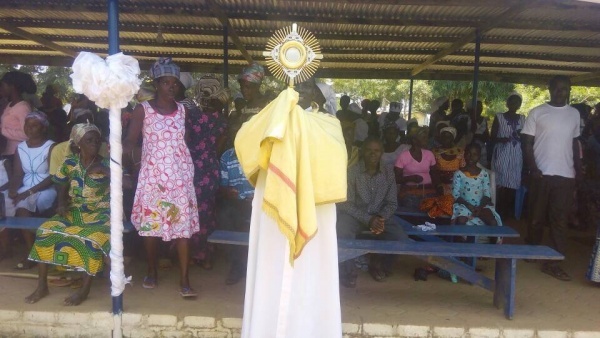 Monsignor Simon initiated spreading Eucharistic Adoration to every diocese in Ghana. 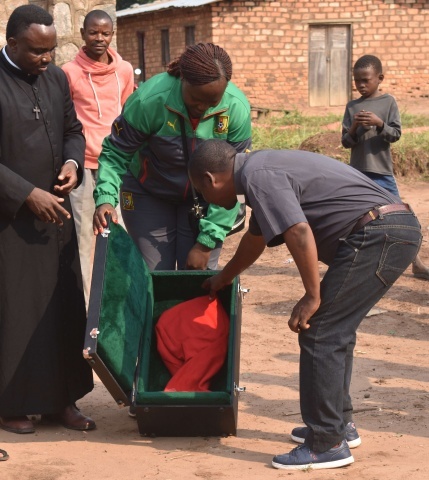 Having received donations for 13 monstrances, the distribution process has started! 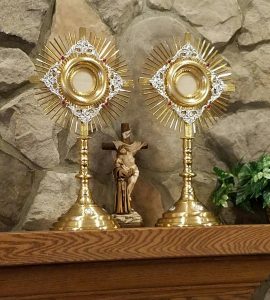 Many of the priests receiving monstrances didn’t have anything for Eucharistic Adoration, and the ones that did had very simple monstrances. Catholic World Mission is thankful for your generosity–you gave a beautiful gift to the deserving priests and people of Ghana! 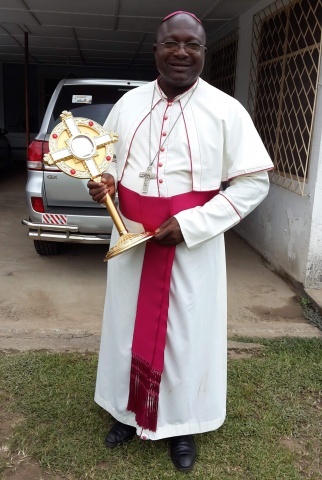 Monstrances have been delivered to Bishop Peter Atuahene of the Diocese of Goaso, Bishop Gyamdi of the Diocese of Sunyani, Sisters of the Society of the Infant Jesus in Cape Coast, Reverend Fr. 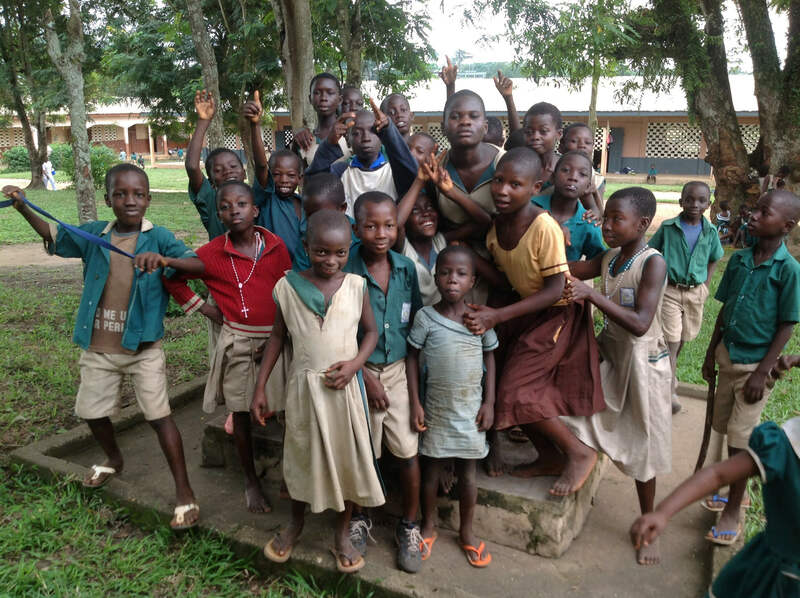 Anthony Aful Broni of the University College of Education in Winneba, Fr. 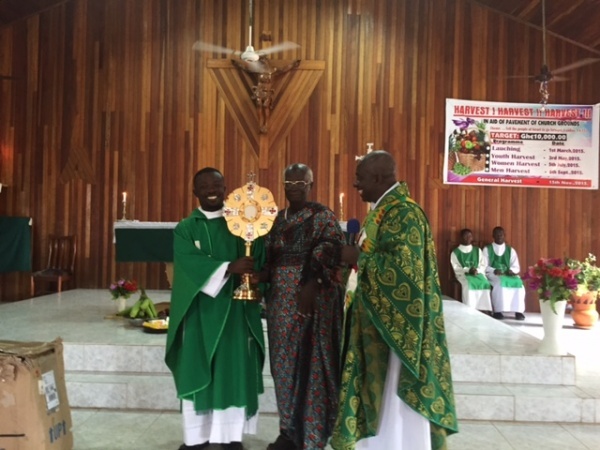 Dominic and Bishop Essien in the Diocese of Wiawso, Bishop John Bonaventure Kwofie of Sekondi-Takoradi, Bishop Joseph Kwaku Afrifah-Agyekum of the Diocese of Koforidua, Vicar Apostolic Gabriel Edoe Kumordji of Donkorkro, Fr. 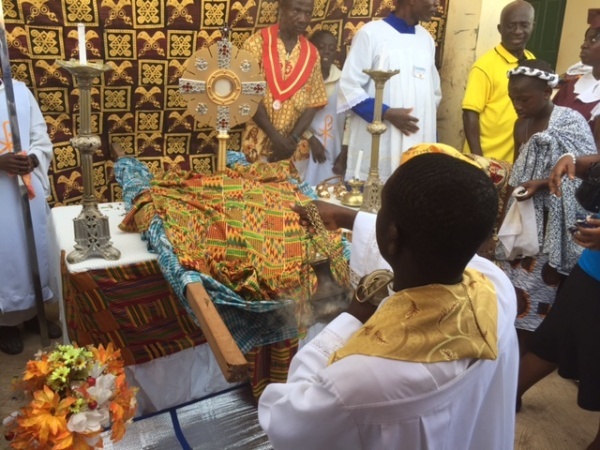 Bokoe of Bonyere St Paul’s Parish in the Diocese of Kumasi and Immaculate Conception Catholic Church in Enchi. View the pictures below to see the joyful and reverent procession of the Blessed Sacrament! 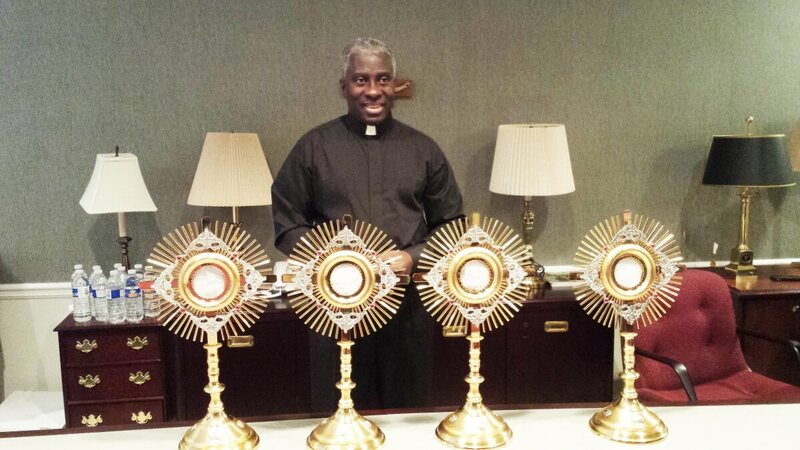 Every Eucharistic monstrance we send is received with immense joy. 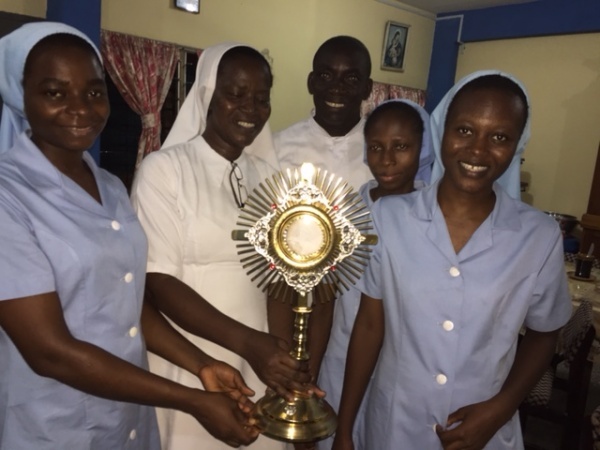 We are so thankful for Monsignor Simon’s call to bring Eucharistic Adoration to Ghana and help the people feel the presence of the Lord in an undeniable way. This would not be possible without the contributions of generous benefactors. Thank you! Father Anthony Eshun spent several weeks in the United States during the summer of 2017. He is from Takoradi, Ghana, and has been a priest in the Diocese of Sekondi-Takoradi for 19 years. Fr. 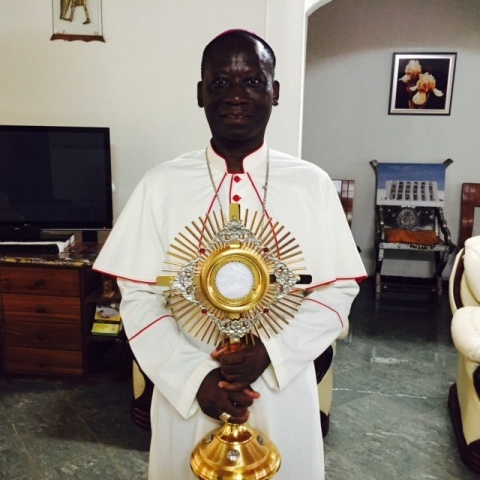 Anthony was so excited to receive this monstrance on behalf of the faithful in Takoradi. 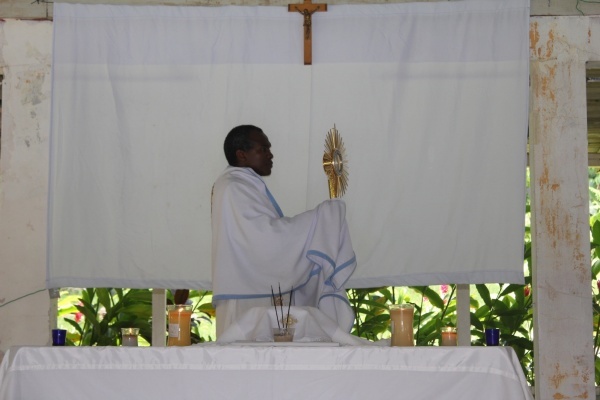 Adoration is available for the first time ever at Our Lady of Lourdes Grotto in Egyam Takoradi, Ghana. 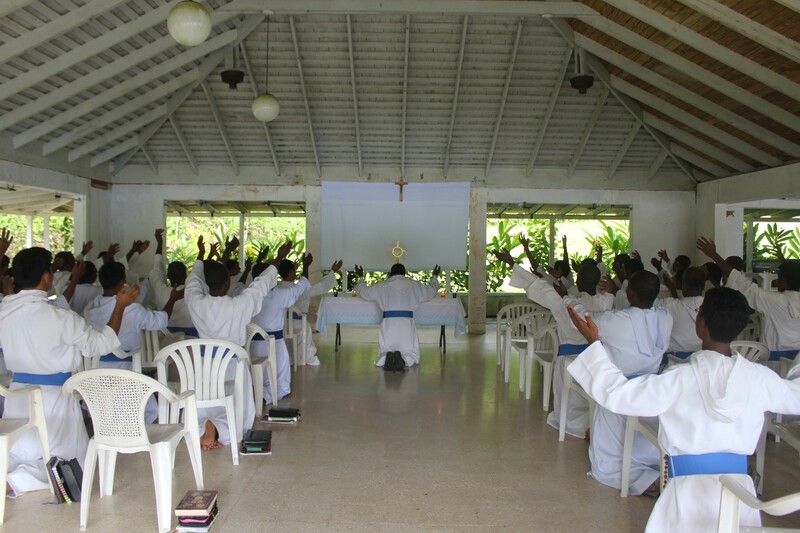 In 2014, Father Brian Kerr, MOP, came to Catholic World Mission with a simple request: he wanted to promote Eucharistic Adoration in the centers the Missionaries of the Poor operate in Haiti. 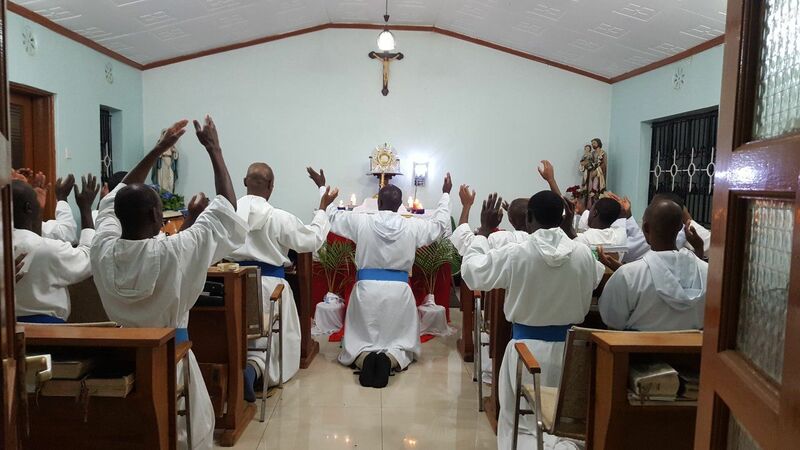 The Missionaries of the Poor pray as a community before the Blessed Sacrament, exposed in their new monstrance. See photos below! 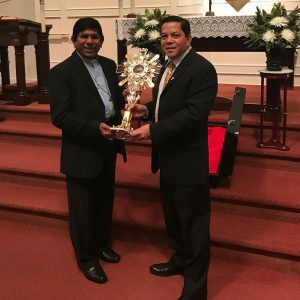 In gratitude to All Saints Catholic Church in Dunwoody, Georgia, for all they’ve done to support Catholic World Mission, we were proud to present Msgr. 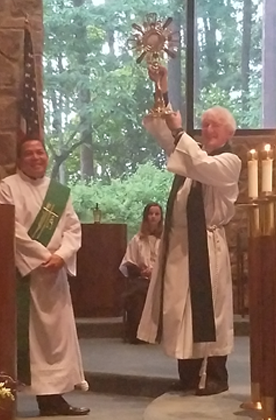 Hugh Marren, All Saints pastor, with a new monstrance for the parish. 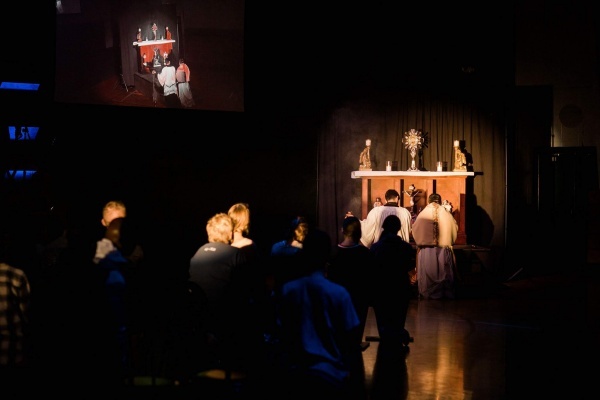 All Saints hosts a monthly Eucharistic adoration night called XLT for all youth in the Archdiocese of Atlanta. 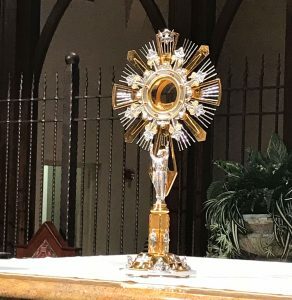 The new monstrance will be used at XLT to help teens, young adults, parents, and chaperones have an encounter with Jesus in the Eucharist! Check out these great photos of the new monstrance being put to great use during XLT Atlanta, a night of praise and worship that culminates in a powerful time of Eucharistic Adoration. 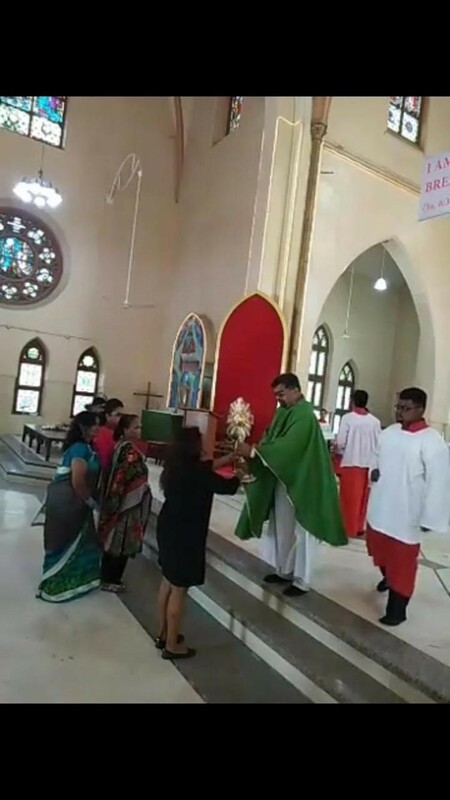 For Archbishop George Antonysamy, of the Archdiocese of Madras and Mylapore, India, the family is the bedrock of the faith in India and for the whole Church. 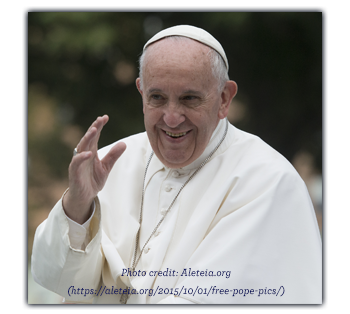 He told us, “If the family isn’t sound, the Church will not be sound.” This is true, especially when the Cathechism of the Catholic Church teaches that the family–the domestic church–is the primary catechist for children. “Family catechesis precedes, accompanies, and enriches other forms of instruction in the faith” (CCC 2226). 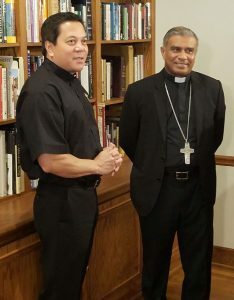 Archbishop George dreams of building a center in his archdiocese devoted to the Holy Family, where families can come for counseling, faith formation, and spiritual retreats. 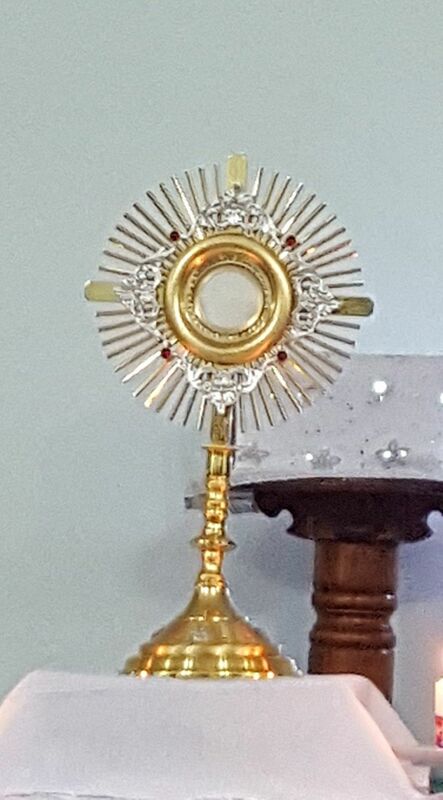 He requested a monstrance for this center, so that all the families who come can know Jesus and receive graces from sitting at the Lord’s feet in adoration. Along with Catholics, Archbishop George taught us that Hindus and Muslims also have a great devotion to the Blessed Virgin Mary. 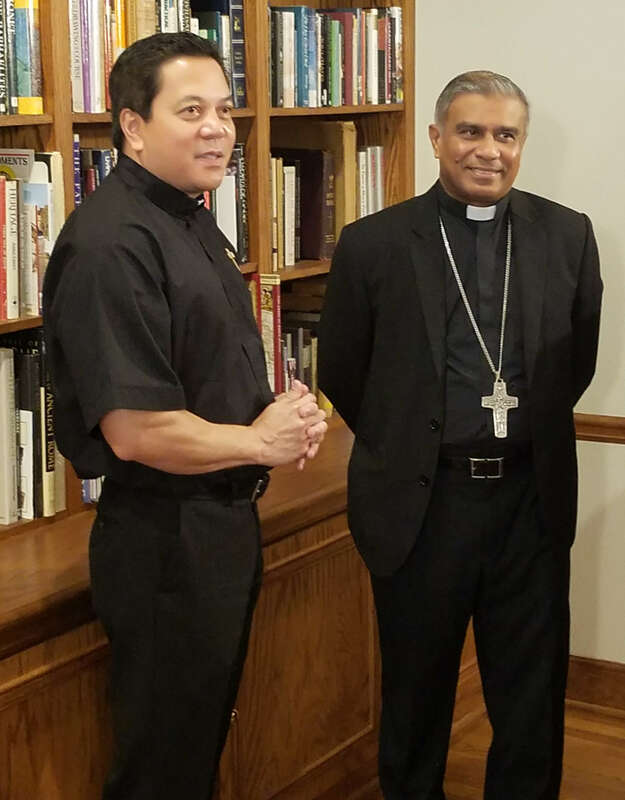 Hindus and Muslims make up the majority of the population in India, and Archbishop George wants to help form all families, so the Holy Family Center will be open to practitioners of all faiths–Hindu, Muslim, and Christians. 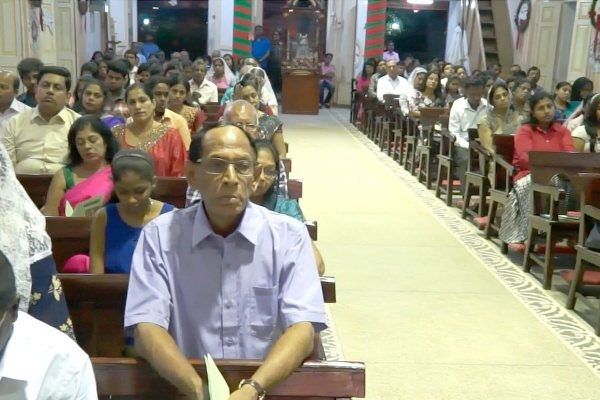 Archbishop George wants to teach all families how to pray together and how to resolve conflicts and grow stronger together. 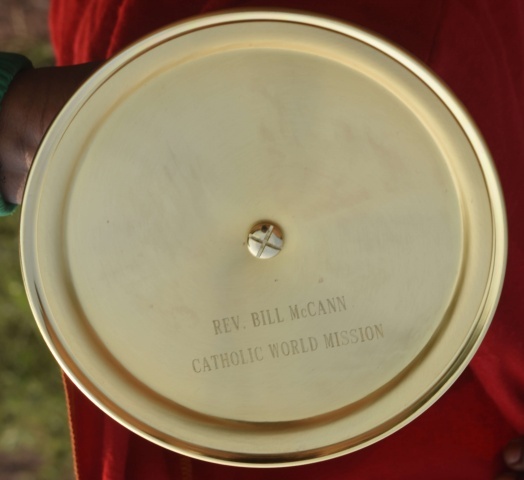 It is so exciting to be part of that mission in an integral way by providing a monstrance! 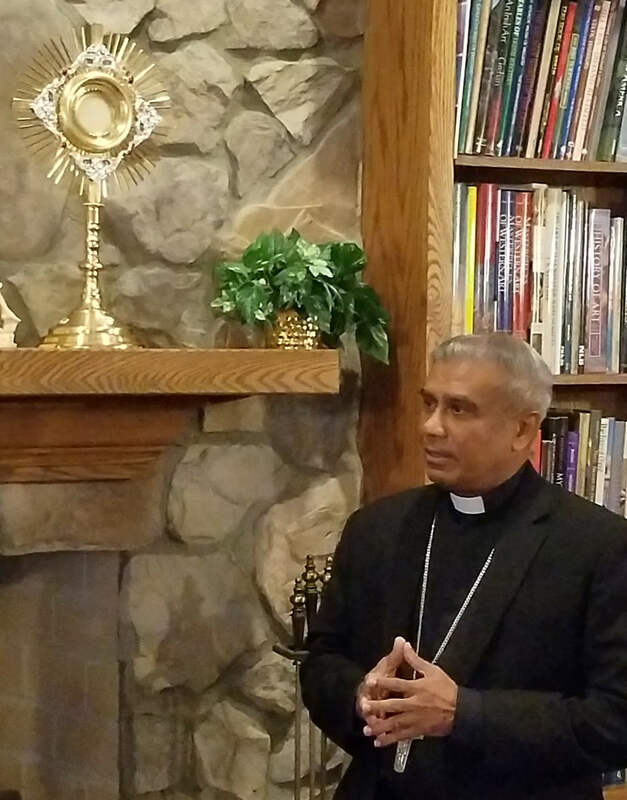 One major impact Archbishop Antonysamy hopes adoration in the Holy Family Center will have is on priestly vocations. 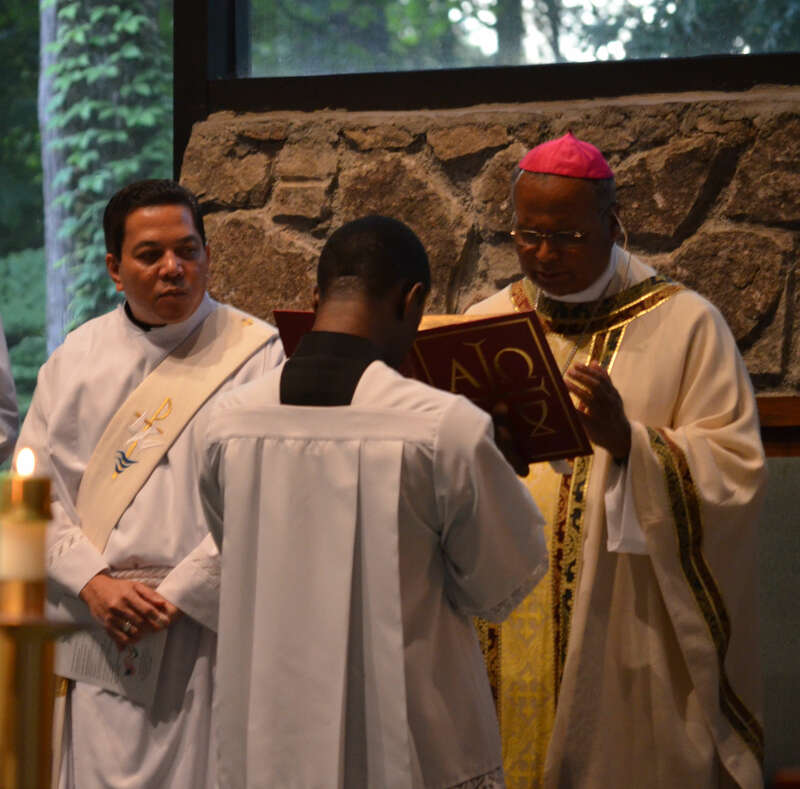 Archbishop George sees that forming families goes hand-in-hand with forming the hearts of men called to the priesthood. 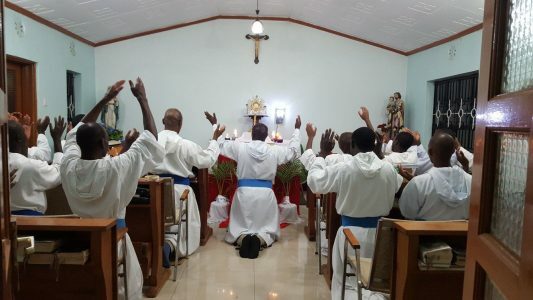 He wants to mold the hearts and minds of these men in a special way so that they know that by giving their lives in service to God and his Church, they are doing more than taking up a job or career. They are, in fact, responding to God’s deep love for them. He wants to form families, too, so that they more fully understand their son’s calling and their own vocations. Two months ago, Fr. Simon started a prayer group that gathers to pray for an increase in vocations and to bring personal intentions to the Lord. 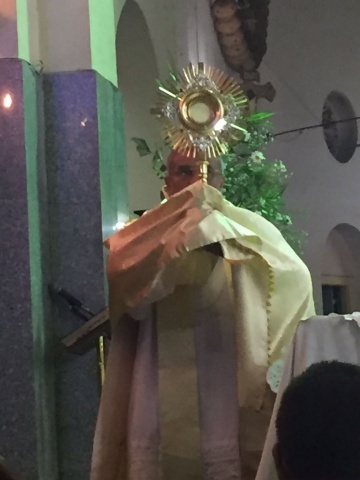 His desire is to make adoration available during these prayer meetings, so that the faithful who come can bring their needs to Jesus in a very special way. 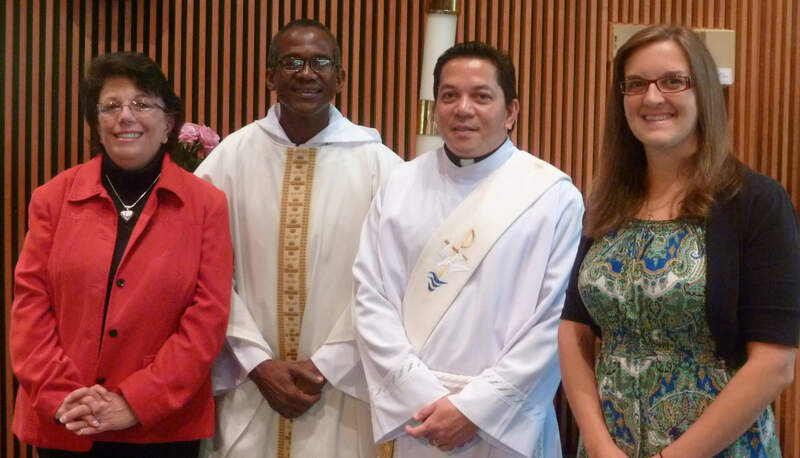 This prayer group currently celebrates mass together for their intentions, and Fr. Simon is excited to be able to add adoration to their prayer nights as well! One of the fruits Fr. Simon hopes will come from Eucharistic Adoration in his area: that the community in Seoul, which is still in a period of “laying foundations,” so to speak, will be strengthened as they draw closer to Jesus. Please keep Fr. Simon and his mission in your prayers. 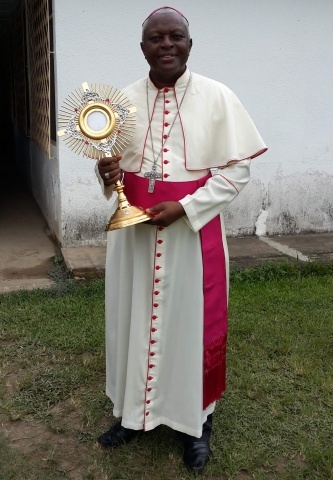 He has been a Legionary for 27 years, and was ordained to the priesthood in 2002. 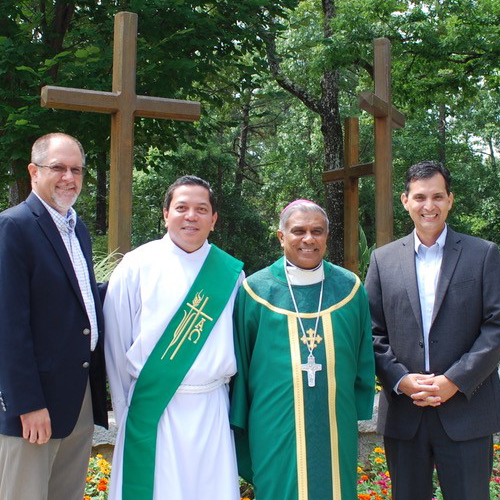 We are grateful for his “yes” to his vocation, and we are honored to support him with our prayers. Fr. 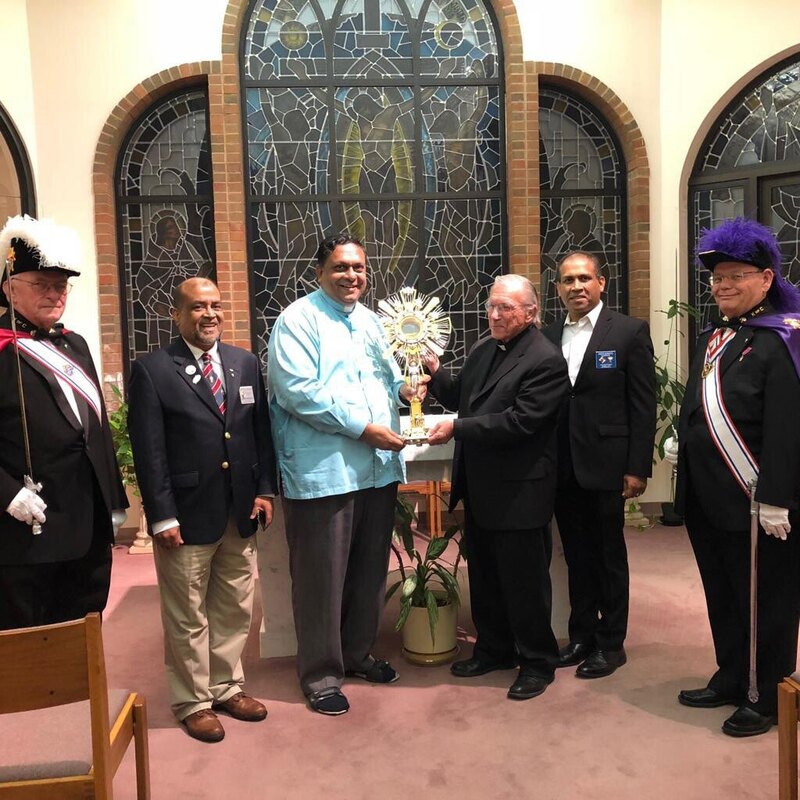 Frank Formolo, LC, received the monstrance on behalf of Fr. Simon Chung, LC. Deacon Rick Medina, Executive Director of Catholic World Mission, presented it to Fr. Frank. Fr. Simon is currently stationed in Seoul, in South Korea. He will be in the US for Christmas, and will be able to pick up the new monstrance and take it back to Korea in the new year. 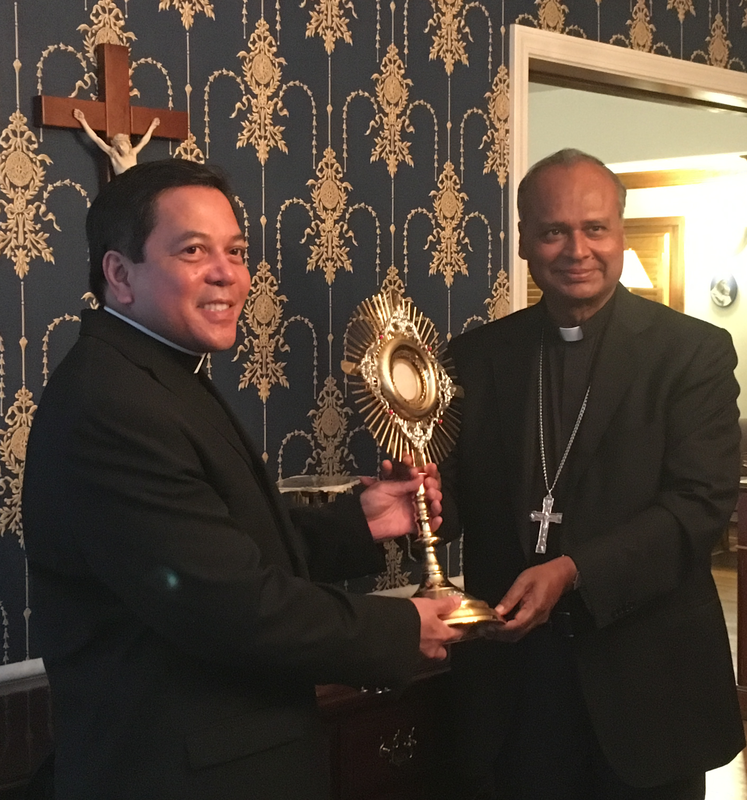 In August 2017, Bishop Harry Perera visited Catholic World Mission to receive two new monstrances for the Diocese of Kurunegala. 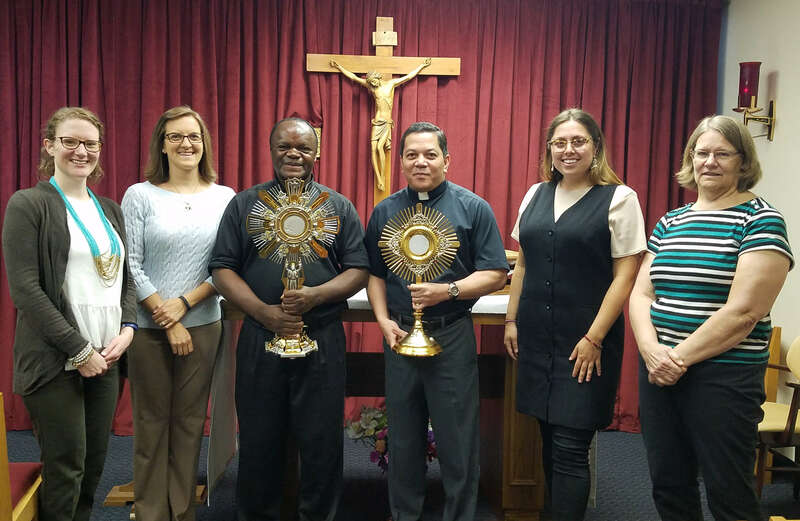 Bishop Harry shared his plans for the monstrances: one will be used immediately for the diocese’s monthly day of reflection for priests, and the other will be installed in a perpetual adoration chapel that will be added to Bishop Harry’s cathedral in Sri Lanka. “Without the Eucharist,” Bishop Harry added, “there is no priesthood!” This is a point that is incredibly important to him. He repeated it several times during our visit with him. 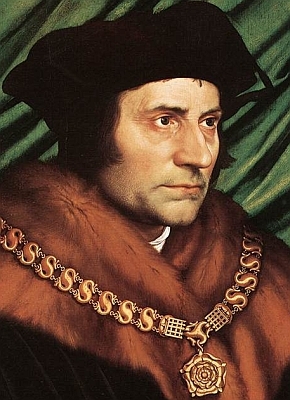 His love for the priesthood and his commitment to Jesus in the Eucharist is strong. 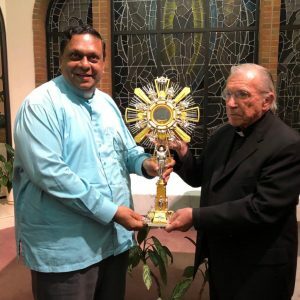 A monstrance was presented to Fr. David Gomes of Dhaka, Bangladesh in September 2018. 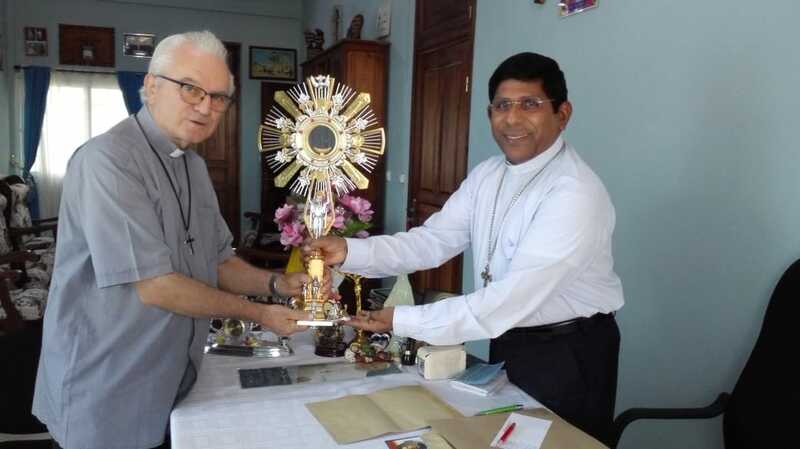 This monstrance will be used in St. Mary’s Cathedral of the Archdiocese of Dhaka. Fr. 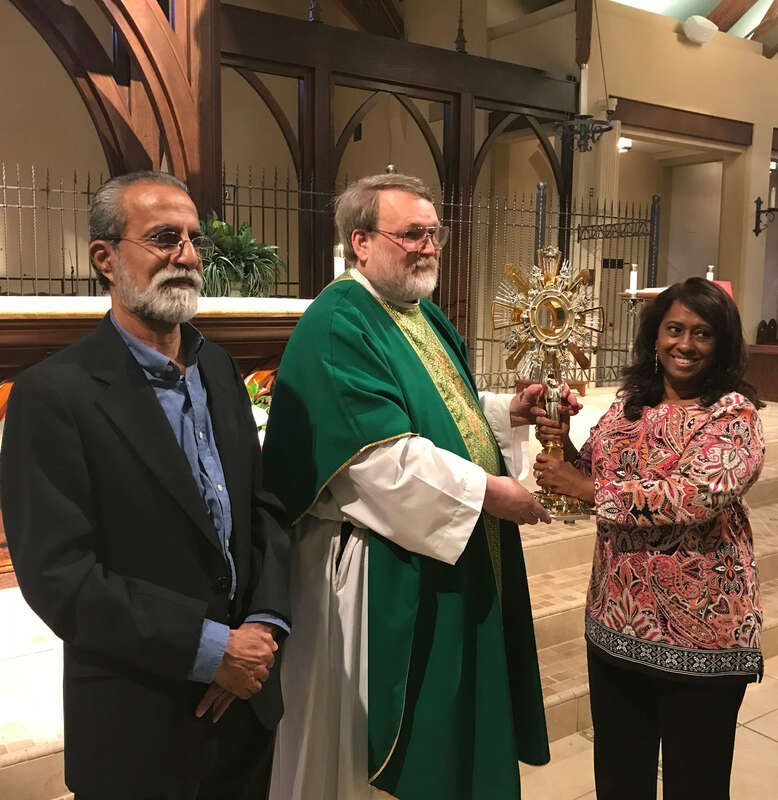 Joel Grissom, SM, parochial vicar of Our Lady of the Assumption in Atlanta, GA, presented a new monstrance to the Joseph family. The Josephs received this monstrance on behalf of Joseph Cardinal Coutts. 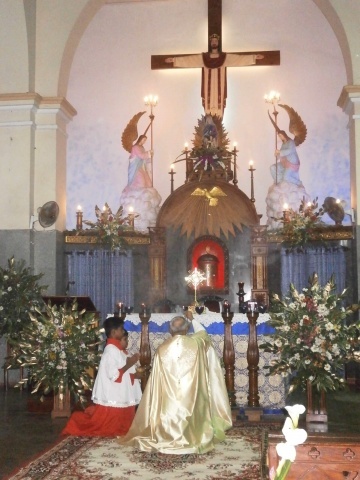 Cardinal Coutts is a newly ordained cardinal in Pakistan. 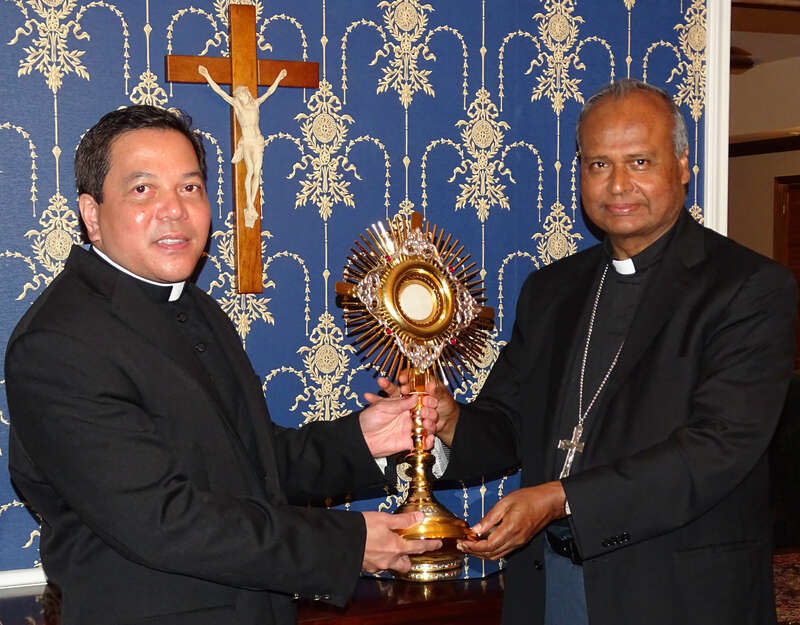 This new monstrance will be used at St. Patrick’s Cathedral in Karachi, Pakistan. The Joseph family presented the new monstrance for the Archdiocese of Karachi during their visit to Pakistan in October. 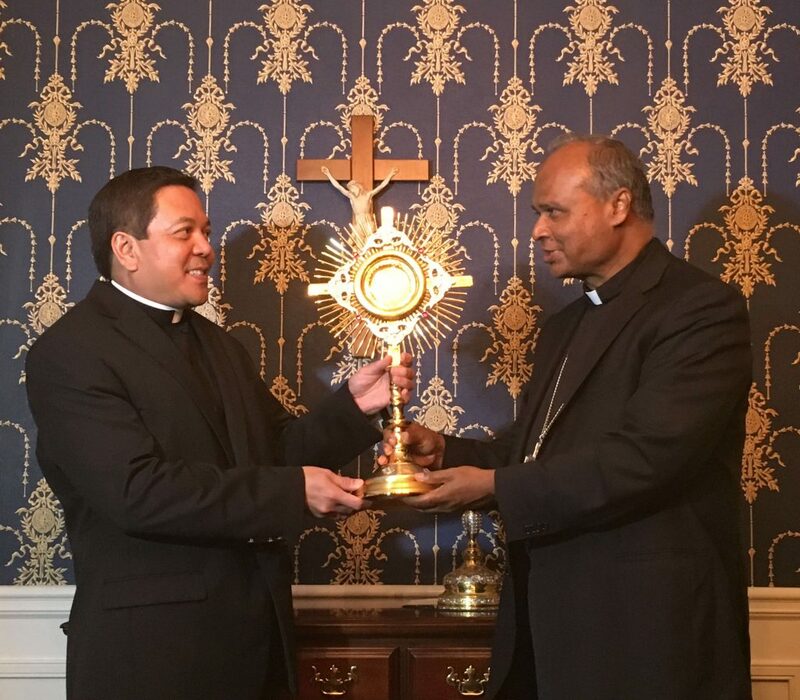 Bishop Harry visited Atlanta this month, and we were able to present him with another monstrance for his diocese! 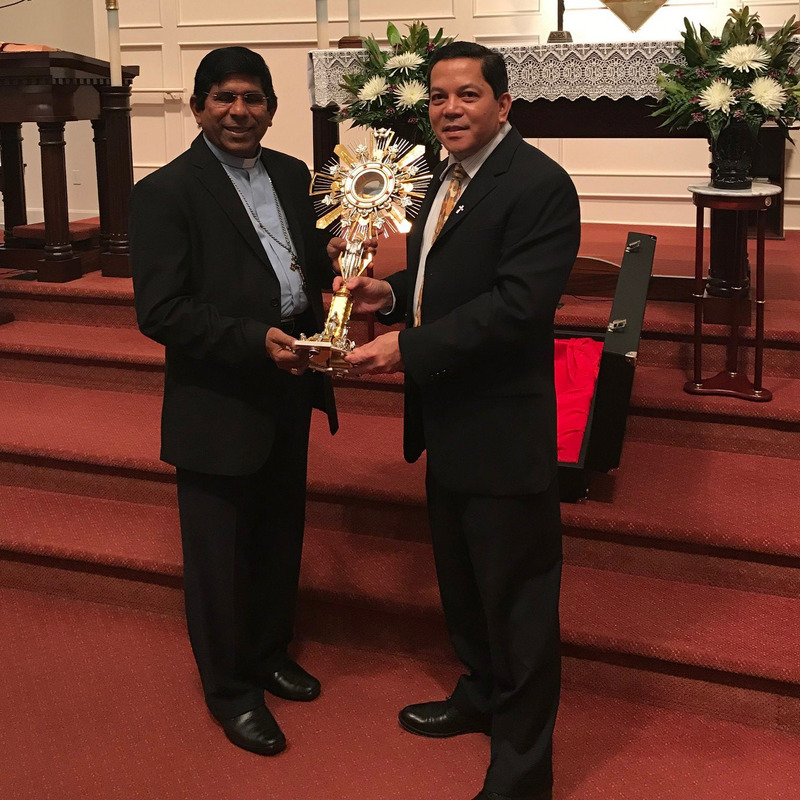 Two of Catholic World Mission’s board members, Oscar Tanaka and Nick Donnelly, were on hand to present the monstrance to Bishop Perera. 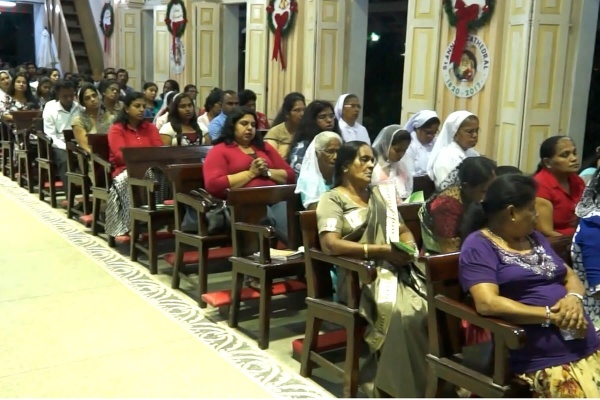 Bishop Harry sent us photos from a recent event held for the local faithful in Kurunegala. 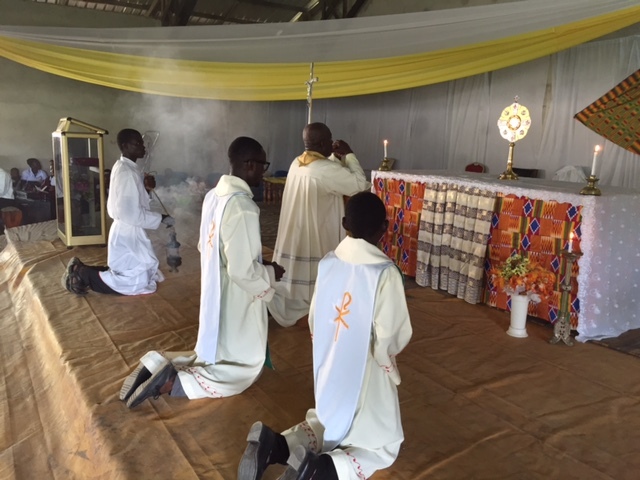 Click through the pictures below to see snapshots of benediction, and religious and laypeople in prayer. It’s beautiful to see Jesus being adored in different places around the world! We’re getting ready to find homes for 8 new monstrances in 2019! Stay tuned for the latest! 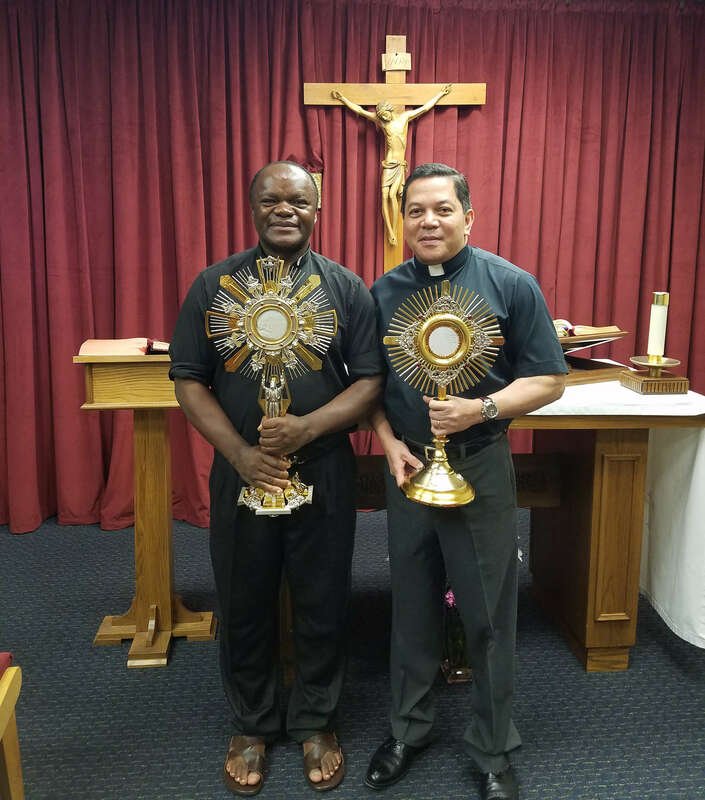 Check back often to see the fruits of Adoration around the world, and to see when new communities receive their monstrances! 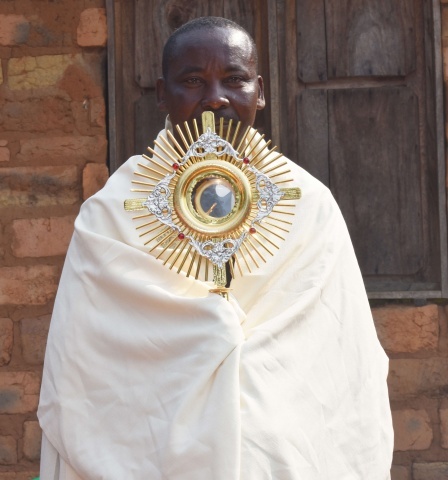 We want to be able to send everyone a monstrance, but we need your help to do it! 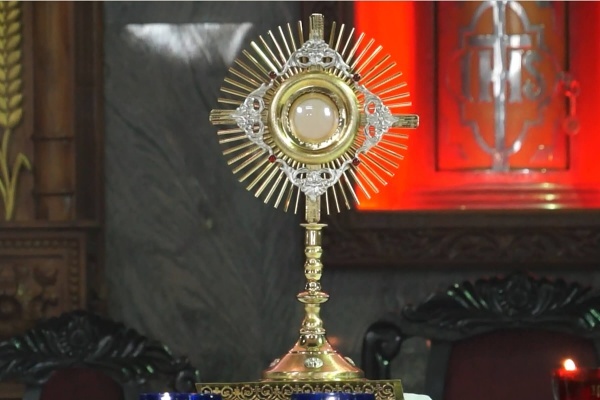 Each monstrance costs about $2,500, which includes the monstrance itself, the luna (glass piece that holds the Blessed Sacrament in place), and a carrying case to transport the monstrance. 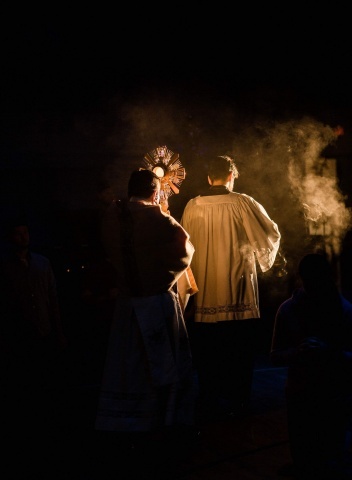 You can be the reason someone encounters Jesus in the Eucharist for the first time! 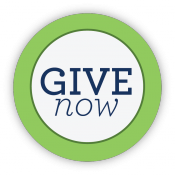 Click the green button below to make a donation that helps send a new monstrance to a community in need.